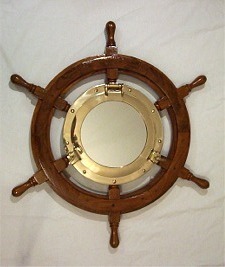 Portholes are essential to any ship or boat or nautical decor. They seal up tightly against the elements and don't allow water in while allowing light to come into a cabin and air to circulate if opened. Our portholes come in many sizes and materials. Some are brightly polished brass, some are carefree aluminum. NOTE:: All of our portholes can be converted from mirror to window glass. NOTE 2:: INSTALLATION INSTRUCTIONS Can be found and downloaded at this LINK. Highly polished heavy solid brass oblong porthole window with standard glass and polished brass dogs and hinges. Great for any nautical decor. 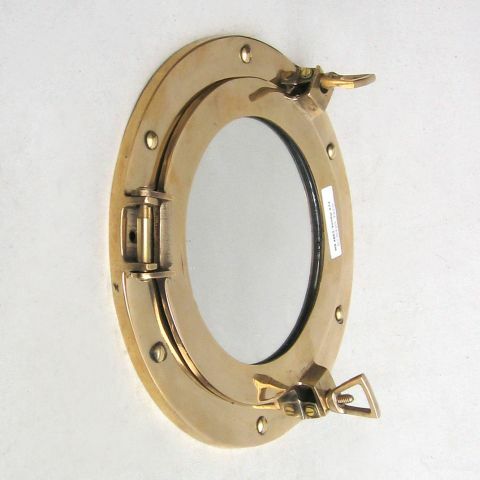 Highly polished heavy solid brass oblong porthole window with polished brass dogs and hinges. Great for any nautical decor. 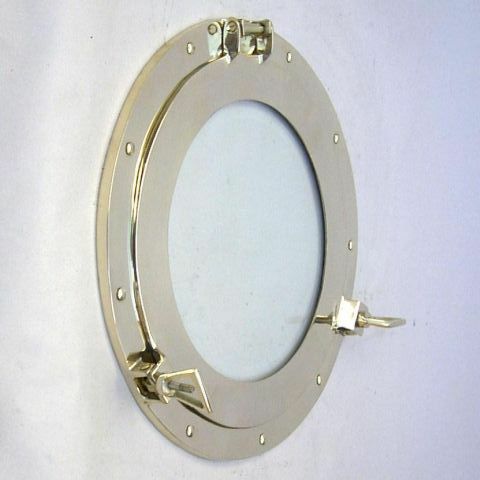 Highly polished solid brass best quality larger size porthole mirror. Brass dogs and hinges. Lacquer coated. Great for any nautical decor. 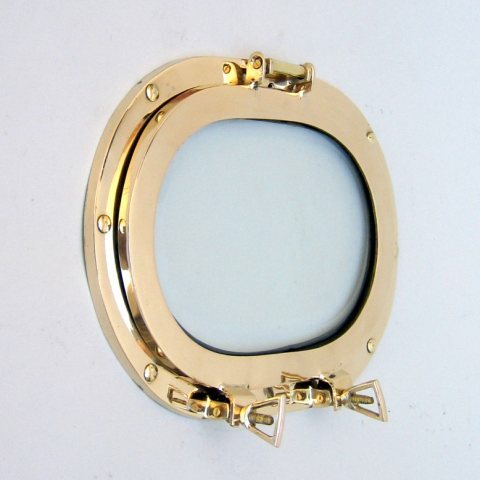 Highly polished solid brass porthole window with polished brass dogs and hinges. Glass has rubber seal. Great for any nautical decor. 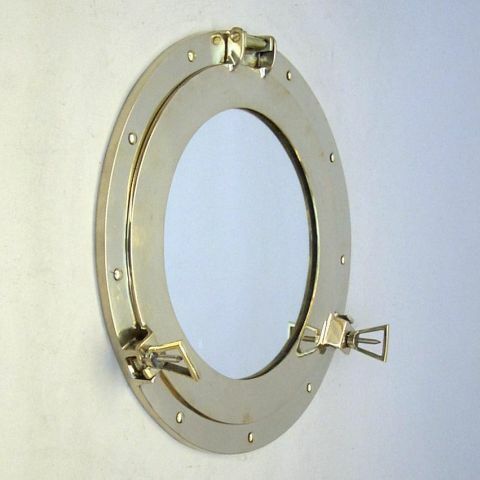 Highly polished solid brass porthole mirror with polished brass dogs and hinges. Mirror has rubber seal. Great for any nautical decor. Highly polished heavy solid brass porthole window with polished brass dogs and hinges. Mirror is 7-1/4" diameter. Great for any nautical decor. 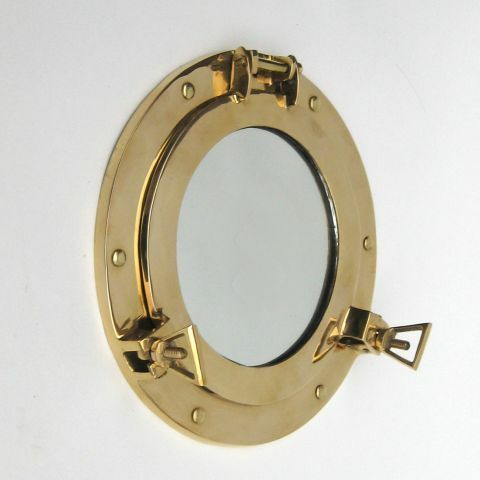 Highly polished heavy solid brass porthole mirror glass and polished brass dogs and hinges. Mirror is 7-1/4" diameter. Great for any nautical decor. 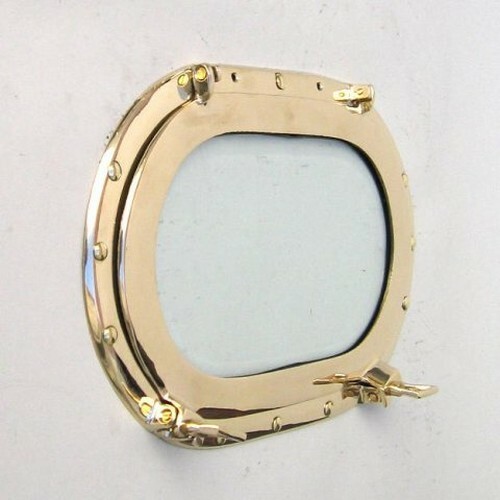 Highly polished heavy solid brass smaller size porthole window glass with polished brass dogs and hinges. Mirror is 5-3/8" diameter. Great for any nautical decor. 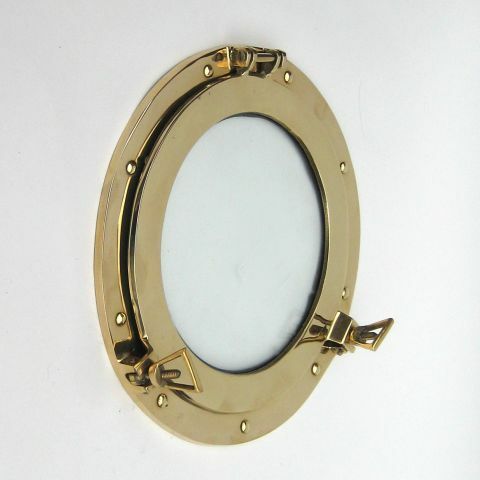 Highly polished heavy solid brass porthole mirror glass with polished brass dogs and hinges. Mirror is 5-3/8" diameter. Great for any nautical decor. Highly polished heavy solid brass nickel plated porthole mirror with polished brass dogs and hinges. Mirror is 7-1/4" diameter. Great for any nautical decor. 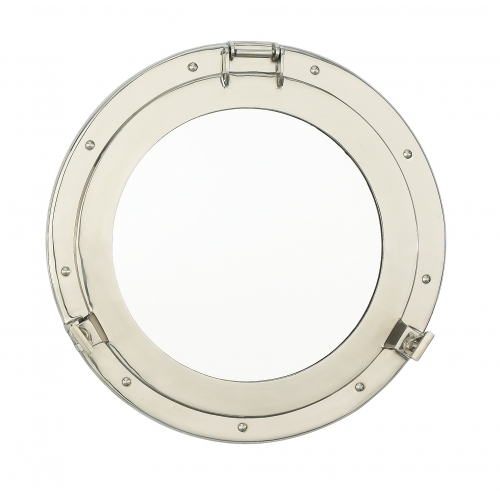 Highly polished heavy solid brass nickel plated porthole mirror with polished brass dogs and hinges. Mirror is 10.5"
diameter. Great for any nautical decor. Highly polished heavy solid brass nickel plated porthole mirror with polished brass dogs and hinges. Mirror is 11.5" diameter. Great for any nautical decor. Highly polished heavy solid brass nickel plated porthole mirror with polished brass dogs and hinges. Mirror is 13.5" diameter. Great for any nautical decor. Window -11.5" High quality heavy duty "real" porthole window. Seals waiter tight, can be used on boat, yacht or ship as an exterior thru-hull porthole. Sealed with heavy glass window. Window -14.25" High quality heavy duty "real" porthole window. Seals waiter tight, can be used on boat, yacht or ship as an exterior thru-hull porthole. Sealed with heavy glass window. 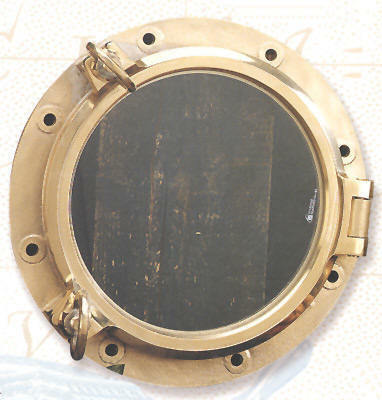 High quality heavy duty "real" porthole window. Seals waiter tight, can be used on boat, yacht or ship as an exterior thru-hull porthole. Sealed with heavy glass window. 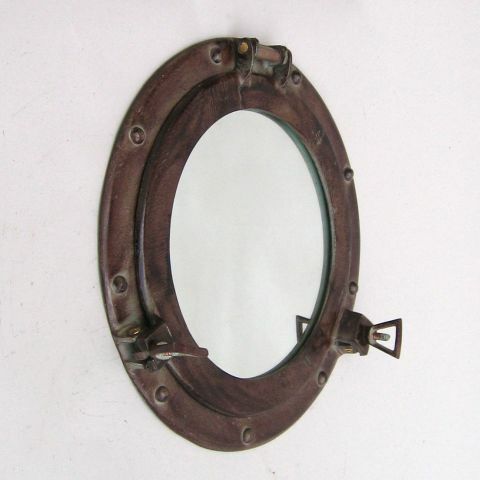 Antique Style Wood Porthole Mirror - 17"
Hand crafted hardwood porthole mirror. Made from a grainy hardwood for the antique look. Great for every nautical decor at home or office. 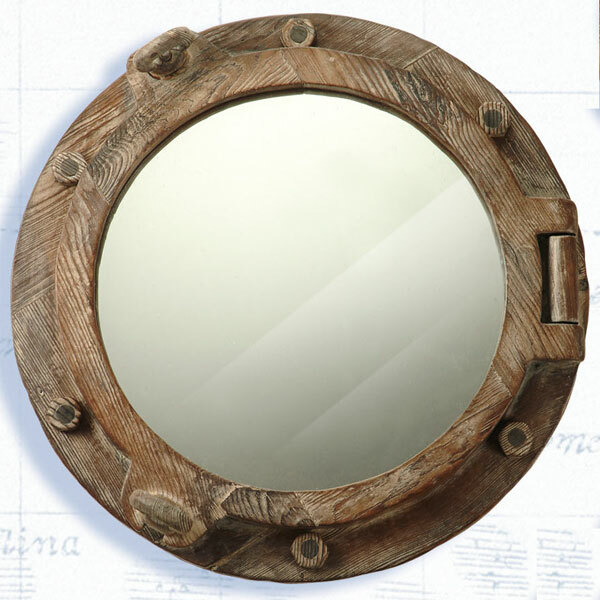 Distressed Wood Porthole Mirror - 17"
Hand crafted distressed hardwood porthole mirror. Made from a grainy hardwood and painted to give it an antique look. Great for every nautical decor at home or office. White Wood Porthole Mirror - 24"
Hand crafted white hardwood porthole mirror. Made from a smooth hardwood and painted to give a nice finish. Great for every nautical decor at home or office. Lightweight poly-stone replica of a porthole mirror. Solid unit does not open. Great for every nautical decor at home or office. Solid Nickel Chrome Plated Porthole Mirror on painted black hardwood base. A very attractive piece for any up-scale nautical decor. Ships Wheel Porthole Mirror - 18"
Highly polished solid brass 12" porthole mirror mounted on a solid teak 18"ships wheel. 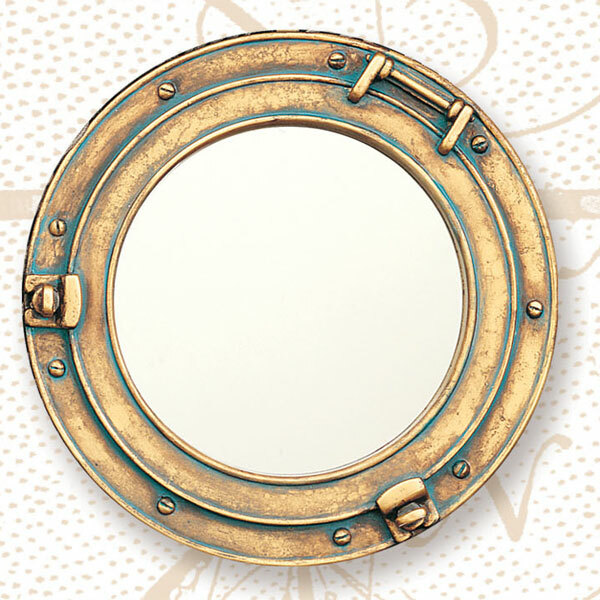 Brass Porthole mirror is lacquer coated for lasting shine. 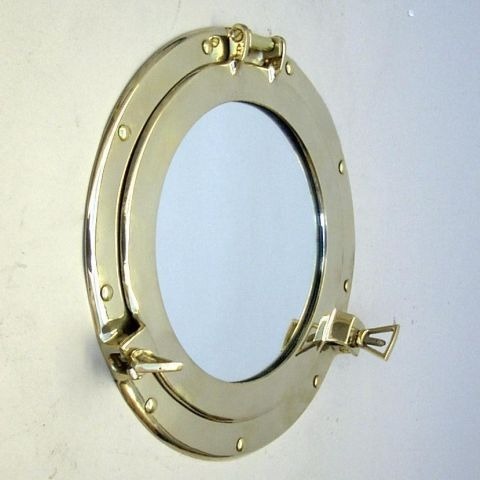 Ships Wheel Brass Porthole Mirror - 25"
Highly polished solid brass porthole mirror mounted on a solid teak 25" ships wheel. 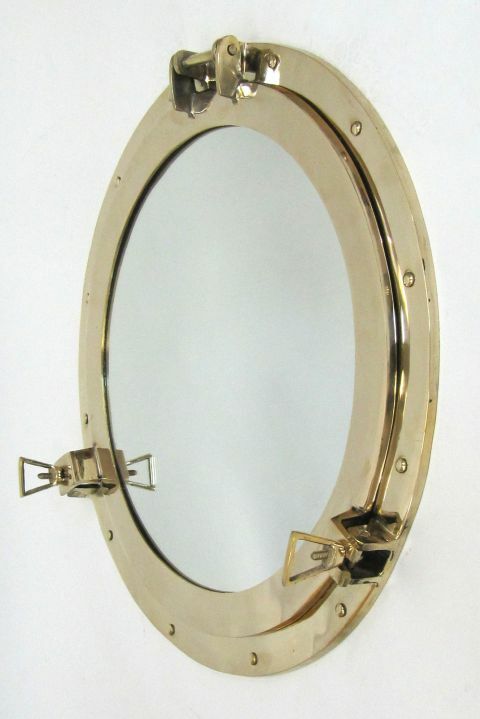 Brass Porthole mirror is lacquer coated for lasting shine. Porthole is 11" in dia. 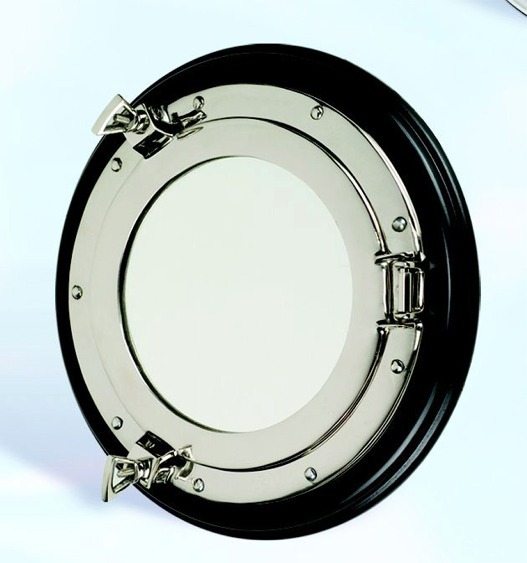 Size: -25"
Porthole Note: All of our portholes can be converted from Mirror to Window glass. We no longer offer Safety Glass.